A really neat way to look at some great books is just to walk into a local used or rare books store and brows through the art/architecture/planning section(s). Yesterday for $4 I bought a book entitled Mixed Land Uses from 35 years ago, as well as another book entitled "Renderings" from the same time, from the library of SOM, with a front cover picture of the 'health education and welfare center', architect Paul Rudolph, in Boston. I've googled it and cannot see any pictures of it or any reference to it, so I'm assuming it was never built. Its a mid rise skyscraper. Looks typical for its architectural era. All of the designs in the book are by winners of the Birch Burdette Long Memorial Prize. Isn't that the State Services Center (Hurley-Lindemann building, or perhaps the never-built tower portion)? http://www.c20society.org.uk/botm/ar...boston-ma.html refers to it as the 'State Health, Education and Welfare Center' which may have been its original name. Last edited by Ron Newman; 02-20-2010 at 01:44 PM. 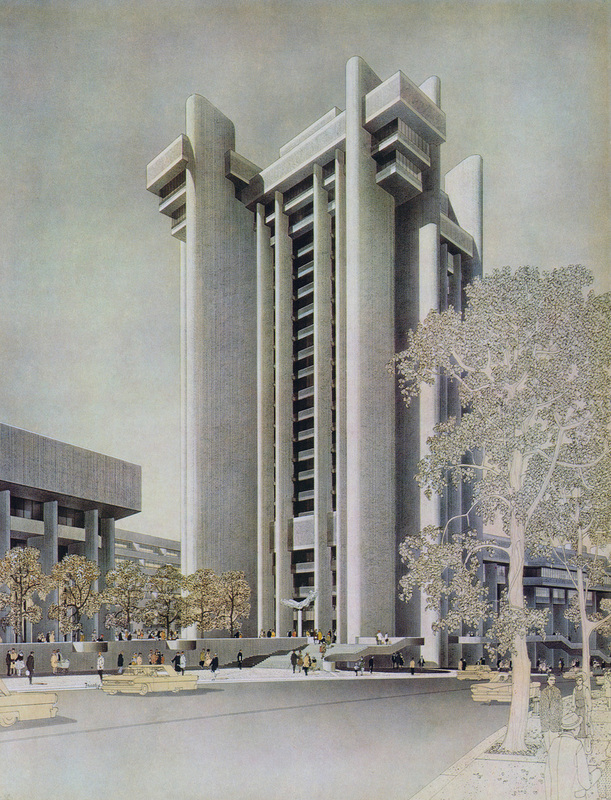 ...with a front cover picture of the 'health education and welfare center', architect Paul Rudolph, in Boston. I've googled it and cannot see any pictures of it or any reference to it, so I'm assuming it was never built. Its a mid rise skyscraper. Looks typical for its architectural era. The tower is the unbuilt portion of the State Services Center/Lindermann/Hurley building. Anyone know the history of why this building was never finished as originally planned? Cost too much. Rudolph too unyielding. Everyone pissed off. Not really related to Architecture/Urban Planning (well, ok, a little), I just finished reading Ken Follet's "The Pillars of the Earth." Awesome. I suggest anyone pick it up if they're looking for a nice, lengthy novel (nearly 1000 pages). I'm about 2/3 done with the follow-up, "World Without End" and like it, but not as much as Pillars. It's set in 12th century England in a fictional village called, Kingsbridge. It's essentially about the struggle to get a Cathedral built (going into some nice architectural detail) in the town. Great read. I like the consensus on Death and Life here. For me, I had difficulty trying to put myself in her shoes. I felt like I was listening to a lot of ranting and story telling that added little to the overall themes of the book. What I got from it was basic principles that remain true even though the neighborhoods described in the book are completely different than what they were back then. I DID enjoy the real window back in time she provided. I'm 24, The North End has always been a vibrant, somewhat pricey neighborhood in my lifetime. Same with the West Village and other places she describes. It's not too often that you get to really look back into not only what these areas were like, but the perception of them. I can think of plenty of cool, gritty neighborhoods that are considered crappy or slummy by many today that are really ethnic, working class gems. The book wasn't as easy to read as I though, but I enjoyed it. I'd also recommend Great Streets by Allan Jacobs and The City Shaped by Spiro Kostoff. Just finished The Devil in the White City by Erik Larson. For those not familiar it is the story of the 1893 World's Fair in Chicago juxtaposed with the store of America's first (known) serial killer. It is the World's Fair sections that should interest people here. This thing was built by a supergroup of some of the greatest American architects. Burnham, Sullivan, Olmstead, Root, McKim, Mead & White, Hunt, Peabody & Stearns all working together during the greatest period of American exceptionalism. Of interest to me (although the author only alluded to it) was Sullivan's lobbying for cleaner, sleeker architecture and his belief that Burnham's insistence on classical motifs filled with Victorian flourishes set American architecture back 40 years. Although most of this stuff will be second hand for those who are already well versed in Architecture history, it is a great read for those trying to catch up. ^ I would also recommend Devil in the White City, really interesting stuff. 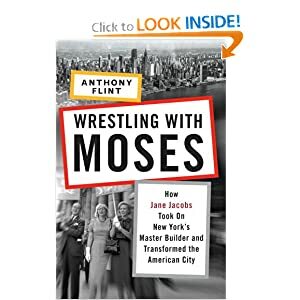 I recently read "Wrestling with Moses," it was interesting and was a good overview of the topic. Nothing really new or remarkable in it though. I'll third the Devil in the White City recommendation. It's a slow read at some points, and loses some focus at the end, but the architectural element was more than enough to keep me interested. More so than the Burnham story, the Olmstead story kept me interested. More so than the Burnham story, the Olmstead story kept me interested. Have you read A Clearing in the Distance? No sir I have not, but consider it added to the list. Just finished Always Something Doing: Boston's Infamous Scollay Square by David Kruh. What a heartbreaking book. Such a great urban space destroyed. The worst part is at the end. He discusses the ongoing debate about how to best utilize city hall plaza. Not only is that debate still going on, but is being repeated verbatim today with the Greenway. Disgusting and shameful. A very interesting read I recently picked up is "Man Made the Town" by Michael Middleton, written in 1987. I think many people on this forum would appreciate its perspective, which views cities as human kind's greatest collective work of art and cultural artifact. Although international in scope, the book has some local references as well. Boston has been mentioned several times in the first 30 pages. One ironic thing about this book is that, in the intro, it mentions how Shell UK financed most of it. An oil company, which is perhaps one of the biggest benefactors of the decline of compact cities, financed a work meant to tout its many splendors. And, while I am on the subject of irony, how odd is it that the automobile industry built one of the biggest "cities" in the country (detroit, obviously). And how odd is it that the fastest growing "city" in the world up to the financial meltdown, with the tallest and therefore in some ways most densely situated footprint building, was financed by petroleum profits (Dubai)? These little things fascinate me. The car has led to the decline of some cities, but the rise of others. And, while I am on detroit, I have to mention that this weekend I was having a nostalgic moment for 1980s action flicks and had a robocop marathon of sorts. The interesting thing is that, even in 1987, there was talk, even if fictitious, about scraping all of detroit (as there is today regarding greenbelts being interspersed into a smaller urban footprint). And finally, one last point, and I'm sure some of you already do this, is that, if you don't already, you need to enter and browse through a good used or rare bookstore. Go to the architectural section, which usually includes urban planning and interior design too, and see what they have. Often times there will be a book that will be tremendous reading or reference, and it costs a fraction of what a new book at a major retailer would cost. A publication called "Lapham's Quarterly," of which I had not heard until recently, has a current issue out called "The City." It is essentially a collection of insightful essays and points of view from the perspectives of people ranging from urban planners to ancient Greek philosophers regarding a host of urban issues. Although I haven't read it entirely, it looks promising as an addition to any urban enthusiast's collection. It is relatively cheap, too ($12 I think). Also, the current issue of Foreign Policy magazine is entitled "Metropolis Now" and the last section of the magazine (about 50 pages or so) deals exclusively with the global demographic shift toward urban living, particular in megacities. This trend is examined from multiple perspectives, and chief amongst the points of view considered is that of Saskia Sassen from Columbia, who some of you may be familiar with. She has been promoting this idea of "global cities" as knowledge based centers of commerce (that's a poor description of her thesis, actually, but the best I can do without something right in front of me explaining it better), and this idea has been causing some waves amongst intellectual theoreticians and planning practitioners recently. There is even one article that argues suburbs are the future. Uh...? Sure. For a tidbit, Boston is ranked at something like the 20th global city on the 2010 "Global Cities Index" in FP magazine. Check it out. is that the Lapham who used to edit Harper's ? Any one here read Ulysses S Grant's Memiors? If so was it a good read, and does one need to be a 19th century warfare buff to understand it? Also did Abe Lincoln write any books?